The sim racing community today licks its wounds following the removal of numerous F1 mods from RaceDepartment, following a claim by F1’s administrative arm, Formula One World Championship Limited. 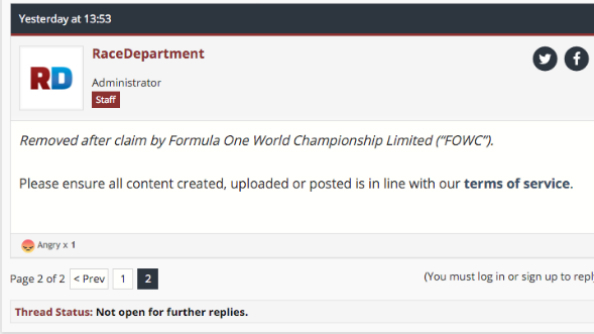 The target of the claim appears to have been directed specifically in relation to user-created content depicting the 2016 F1 season, whether it be tracks, driver names, car skins or complete season updates. Codemasters’ F1 2014 and F1 2013, and the recently released Automobilista, have all had mods removed from their download areas on RD. Like to race behind a windscreen within the safe confines of a rollcage, too? Check out the best racing games you can play right now. It’s hard to get an accurate idea of the exact number of mods that have been taken down, because after a brief window in which the affected mods still appeared in RaceDepartment’s downloads section labelled as ‘[removed],’ they’ve now disappeared completely. PretendRaceCars estimates the total number to be over thirty. FOWC owns the rights to the cars and drivers of the F1 world championship, so any unlicensed usage of those assets is illegal. Appropriation of those assets by the PC sim racing community for non-profit mods hasn’t traditionally been something the sport’s lawyers have given any attention to, though. F1 mods are taken down, from time to time, but it’s usually due to a dispute between modders rather than a cease-and-desist. It’s a bizarre move from FOWC, given that mods have existed for Formula One games for almost as long as the genre’s existed, and have been allowed to be hosted and distributed largely without intervention from the sport’s governing body. Games carrying the official Formula One license have traditionally been obliged to ship featuring cars with tobacco-free, alcohol-free liveries, and as a result anyone seeking the most authentic experience possible has had to turn to the modding community to patch the tobacco and alcohol sponsors back into their games. I remember doing so, very excitedly, for Geoff Crammond’s Formula One Grand Prix 2. More recently, Codemasters released F1 2014 minus the Martini sponsor on Williams F1’s livery, so modders released an authentic skin that brings the real livery back to the game. F1 mods are hugely additive to the sim racing experience. User-created content such as that targeted by the FOWC’s claim often brings a given game closer to what you see on your television, and is both an expression of, and catalyst for, passion for the sport. It’s also a platform for young developers and artists to showcase their skills. So why now? Why pick a fight with a small and diehard community of F1 fans whose mods have, in the grand scheme of things, little to no impact on the image of the sport? Especially during this long and painful downturn for Formula One, as it suffers record low viewing figures and attendances? There’s no clear answer from FOWC, and RaceDepartment don’t appear to have much information on it either. Given that many of the removed mods appeared to contain 2016 content, perhaps it’s a move to safeguard sales of the officially licensed F1 2016 game, in development at Codemasters and due for release later this year. Codemasters themselves haven’t communicated anything to suggest they’re aware of the move, though. In fact, they’ve yet to even officially announce the game. I’m reaching out to RaceDepartment, and to FOWC, for more information, and will update this story when I hear anything back.